The CDASR occupies approximately 6,000 square feet within the Francis de Marneffe building on McLean Hospital’s main campus. In addition to 19 offices, this space includes two electrically-shielded EEG data acquisition chambers with adjoining control rooms, two behavioral testing rooms, three clinical interview rooms, three counters of sharable workstations, and two conference rooms. McLean Hospital is a 213-bed private psychiatric facility with a long tradition of clinical and basic science research; it is the primary psychiatric teaching hospital of Harvard Medical School. This academic hospital setting allows for ongoing patient contact, which grounds this work in clinical psychiatry and allows for synergy between research and patient care activities. Within the CDASR, three rooms are reserved for private clinical interviews. The Center currently operates two high-density EEG systems: a 128-channel system from Phillips/EGI and a 96-channel system from Brain Products. For each system, data acquisition takes place in two electrically and acoustically shielded experiment rooms that provide radio-frequency (RF) and electrostatic shielding, and have a Sound Transmission Class (STC) rating of 55 and a Noise Reduction Coefficient (NRC) of 0.95. The EGI Geodesic EEG System (GES) system includes a NetAmps 300 high-input impedance dense-array amplifier with 128-electrode hydrocel geodesic sensor nets. At least two hydrocel nets of every size are available. System control and data acquisition are handled by Net Station 4.0.2 software running on a Macintosh PowerPC G4 (866 MHz; 512 MB RAM), which can also be employed for EEG data analysis. A PC running E-Prime (2.0 and 3.0) or custom PsychoPy scripts is used for stimulus presentation. The stimulus and response computers are synchronized using network clock sharing over a dedicated direct network link. The second EEG system is based on the BrainVision actiCHamp amplifier, with 96-electrode gel-based actiCAP caps. A CapTrak electrode position localization device is available to capture actual electrode placement geometry, for accurate source localization. Stimulus presentation is driven by a Dell OptiPlex 9010 PC with an Intel Core i5-3475S processor running Windows 10. Millisecond accuracy of the EEG triggers is ensured by using a VIEWPixx LCD glass monitor running at a 120 Hz refresh rate, which transmits stimulus markers via 24 TTL outputs to the actiCHamp amplifier. EEG data recording is performed by a Dell OptiPlex 3020 PC with an Intel Core i5-4590 processor. CDASR scientists utilize the scanning resources at McLean Imaging Center (MIC). The MIC has four MR scanners, including a 9.4T Varian/Agilent scanner for preclinical imaging and three clinical scanners: a 64-channel Siemens Prisma 3 Tesla (3T) scanner, a 32-channel Siemens TIM Trio 3T scanner, and a 4T Varian/Agilent Whole Body DirectDrive™ scanner. 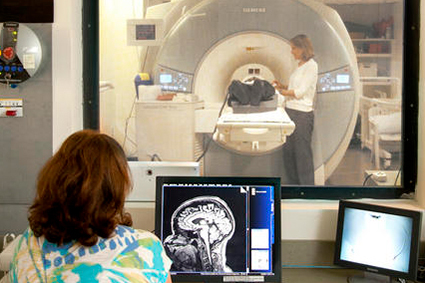 The MIC also provides an MRI simulator for acclimating subjects to MR scanning. Both the Prisma and TIM Trio systems are whole-body 3T MRI scanners with full EPI/fMRI/DTI capabilities as well as proton and multinuclear spectroscopy and multiband EPI. The MIC Prisma features a 64-channel RF system prepared for array coil and parallel imaging, and high speed, high power gradients (80mT/m, 200 T/m/s slew) for efficient echo planar and diffusion tensor imaging. The TIM Trio features a 32-channel RF system prepared for array coil and parallel imaging, and high-speed gradients (40mT/m, 200 T/m/s slew). The SNR and the parallel imaging speed make DTI and fMRI attractive applications for these systems. The Trio has been equipped with an external reconstruction coprocessing computer to speed multiband reconstruction. Additional features on both the Sigma and TIM Trio scanners include the complete set of inline and offline image processing and applications for head and neuroimaging methods including Arterial Spin Labeling (ASL), PACE, Susceptibility Weighted Imaging, Dynamic Angiography (TWIST), patient positioning regularization, and fast T2 anatomic techniques including BLADE and SPACE. Because of the MIC’s research agreement with Siemens, we are also able to use a number of research pulse sequences including dual echo pCASL for performing simultaneous BOLD/ASL experiments, and both the University of Minnesota and MGH Simultaneous Multislice (Multiband) echoplanar imaging sequence for very low TR/high spatial resolution EPI. The 4T Varian/Agilent DirectDrive scanner is the primary MR spectroscopy research scanner. This recently-upgraded digitally-driven system allows for improved stability in real time RF waveform generation as well as signal reception and digitization resulting in greater signal-to-noise and signal fidelity. The scanner has eight 500kHz RF receive channels allowing for the use of phased array coils for imaging and spectroscopy – further improving the sensitivity of the system. The high duty cycle body gradient set allows for rapid multi-slice echo planar imaging (35mT/m, 220us risetime). The system has a wide variety of RF coils, including two quadrature transmit/receive proton head coils, a detunable transmit-only proton head coil for use with surface coils, a number of dual-tuned head coils, including proton/phosphorous, proton/carbon, proton/flourine, proton/lithium and proton/sodium, and various smaller, locally built coils. The 4T scanner is 100% devoted to MR spectroscopy research. 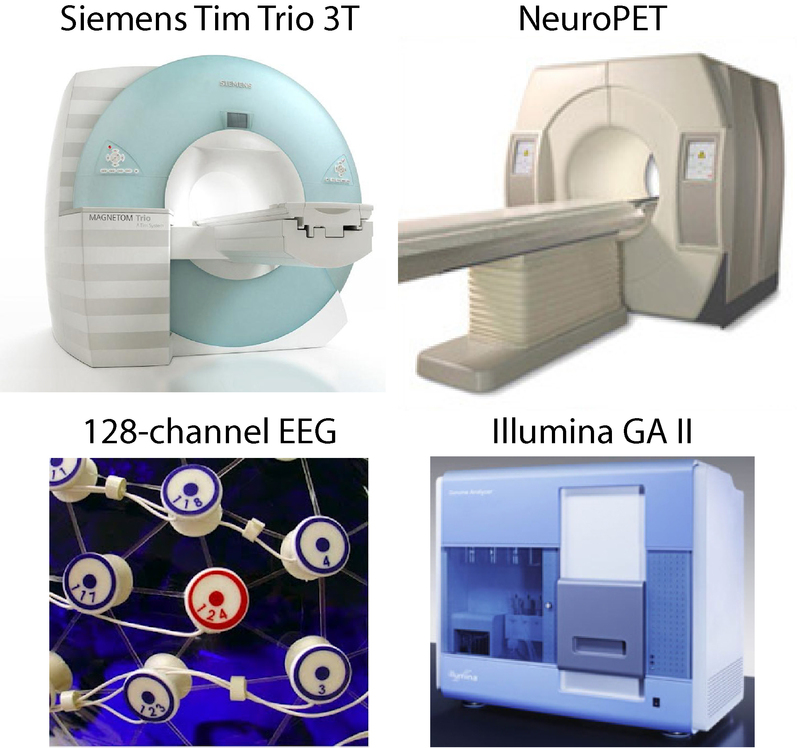 Through our collaborations with Massachusetts General Hospital (MGH), we utilize the PET scanners at the main MGH campus and the simultaneous MR-PET scanner at the Athinoula A. Martinos Center for Biomedical Imaging (https://www.nmr.mgh.harvard.edu/). The Center operates two dedicated server computers for image processing and storage, along with individual office workstations and personal computers for local processing and visualization. The dedicated server computers are located in a secure data center in the McLean Imaging Center. The primary server, used for image processing and data analysis, has 32 core processors, 128 GB RAM, and 38 TB of disk space. To handle overflow and high volume processing, the Center uses the resources of the Partners Research Computing Cluster, with over 6000 cores and 24 GPU processors, up to 498 GB of memory per job, and 4 petabytes of storage. All lab members have local desktop workstations suited to their research. The mix includes approximately forty PC workstations and laptops running Windows 10, and thirty iMac workstations and MacBooks running OS X. Linux is also available as a dual-boot option on many of the PCs. Ten additional workstations are set up in a common area for visiting scientists and students conducting research at the center. Three private testing rooms at the Center are available with standardized PCs and monitors for behavioral testing or completing online surveys. Approximately eight shared laptops and MacBooks are available when conducting subject sessions at the Imaging Center, for stimulus presentation during fMRI studies, as well as other needs. Imaging and electrophysiological data are analyzed using both standard and custom-developed tools. In-house code based on MATLAB and C++ is used for pre-processing and analyses of EEG/ERP data, including space-oriented analyses of scalp EEG and ERP data. Various software suites for scalp and source localization analyses using realistic head models are utilized, including BESA Research (6.1), LORETA (3.0), and Brain Vision Analyzer (2.0). A variety of tools including Statistical Parametric Mapping (SPM8), Analysis of Functional NeuroImages (AFNI), FreeSurfer, FMRIB Software Library (FSL), BrainVoyager, jMRUI, and LC/Model are available for pre-processing and analyzing functional, structural, diffusion, and spectroscopic neuroimaging data. Cross-modal registration of EEG/ERP and fMRI/PET data is achieved using SPAMALIZE or BESA Research. Additional commercial and public software used by the Center includes IDL, MATLAB, SPSS, R statistics/R-Studio, EEGLAB/ERPLAB, Statistica, Adobe Creative Suite, and Brainiac (a computerized interactive neuroanatomy atlas).